Please note this is the final programme, but we cannot exclude that minor adjustments will be needed. In ForestSAT2014 every morning we have a plenary session with the speeches of our keynote speakers. Then at 9:45 parallel sessions start. 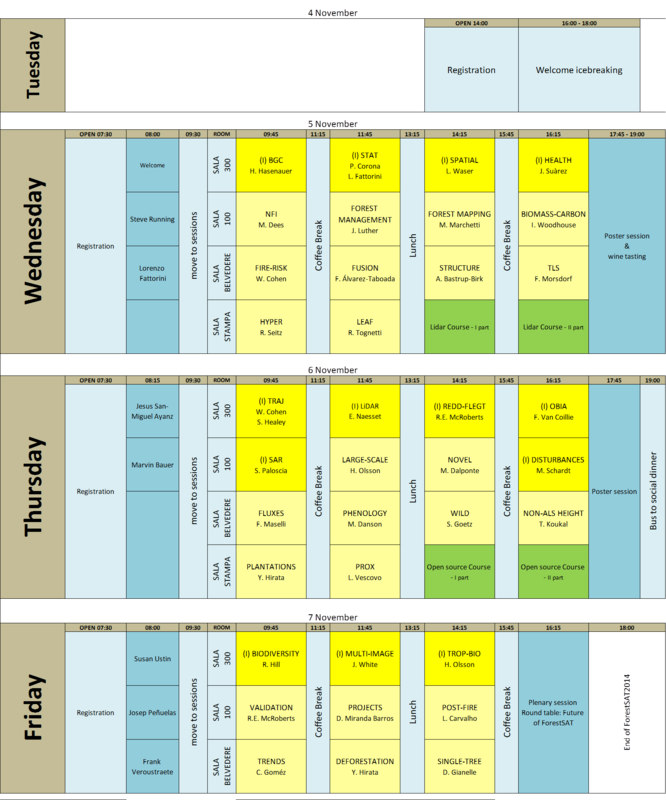 Three or four parallel contemporary sessions are organized daily, together with LiDAR and FOSS courses. All parallel sessions are 90 minutes length. In sessions with 5 contributions presentations must be 15 minutes + 3 minutes for a short discussion. In sessions with 6 contributions presentations must be 12 minutes + 3 minutes for a short discussion. Two official poster sessions are organized on Wednesday and Thursday afternoon starting at 17:45. During these sessions at least one of the authors has to be nearby the poster for answering questions. All the posters must be in place for the beginning of the first poster session and until the end of the conference. Posters have to be in the standard vertical ISO A0 format, download a template here. Saturday the 8th one forest excursion and one cultural excursion are organized. More info are available HERE.